Wie nur wenigen dürfte es Hakola hier gelungen sein, moderne Orientierungslosigkeit in ein kunstvolles, gestaltenreiches Maskenspiel zu übersetzen. (...) Henri Sigfridsson ist hier fast im Dauereinsatz, und seine enorme Technik kommt ihm bei dieser Mammutaufgabe sicher sehr zu Hlfe. Hier wird zugleich mit Neugier und Selbstverständlichkeit musiziert: diese Kombination hat bei zeitgenössischer Musik immer den Charakter eines Glücksfalls. Henri Sigfridsson is exactly the kind of pianist for the Piano Concerto: a big, muscular technique with plenty of power; John Storgårds gets playing of like virtuosity from his Tampere musicians. A barnstormer of a CD. Les musiciens de l'Orchestre de Tampere et John Storgårds s'engagent sans réserve et nous régalent d'un disque original et plaisant. The Piano Concerto (...) is hugely enjoyable, and the solo is dashingly well played by Henri Sigfridsson. A very worthwhile disc. This is seriously entertaining, but also entertainingly serious stuff. This recording will be hard to pass by when it's time to choose the best Finnish classical CD releases of 2009. The Tampere Philharmonic performs the music of Kimmo Hakola magnificently, and Henri Sigfridsson is phenomenal as soloist. (...) Hakola's piano concerto is an imaginative, entertaining and gripping piece. Finnish composer Kimmo Hakola was recently portrayed by The New York Times as, "possessed of a joyful, mischievous spirit." 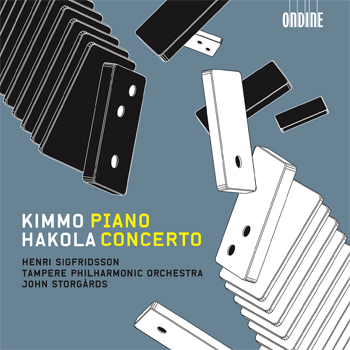 The article described his music as "mixing together shapely lyricism, atonality, quirky folkishness and an almost hedonistic approach to timbre and rhythm" - an ideal characterization of the monumental Piano Concerto, which is the main feature on this new CD release in celebration of Hakola's 50th birthday. The 55-minute work is cast in no less than nine stirring movements, which combine scintillating virtuosity with powerful emotions and humor. With hints of jazz and folk music, in addition to parodist episodes of serial music, Hakola here produces unorthodox and accessible classical music at its best. Coupled with the Piano Concerto is the Sinfonietta for orchestra, a 15-minute work of relentless virtuoso energy. The acclaimed young Finnish pianist Henri Sigfridsson is accompanied by the Tampere Philharmonic Orchestra and chief conductor John Storgårds who have made award-winning recordings of contemporary music.